Except for a few gaps, the tape sounds clean and is presented start to finish as Prince recorded it in his now-demolished home in Chanhassen, Minnesota, the year before his 1984 hit movie and soundtrack "Purple Rain." Fans of Prince expecting his usual pyrotechnic guitar work will be surprised that one of the first official albums released from his fabled vault since his death more than two years ago showcases his jazzy piano playing. "Piano & A Microphone 1983" is just Prince noodling at a piano and singing "Purple Rain" and eight other songs in a one-take recording made at his home studio 35 years ago. Warner Bros. Records releases the album on CD, vinyl and digital formats Friday. Recorded on a simple cassette, the 35-minute worktape brings the music of Prince full circle, said Troy Carter, adviser to the Prince estate. 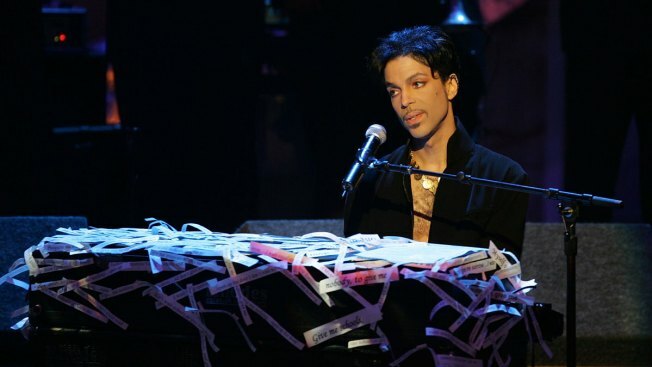 Prince was on his solo "Piano & A Microphone" tour when, at age 57, he collapsed and died of an accidental fentanyl overdose in his Paisley Park home and recording complex in suburban Minneapolis on April 21, 2016, a week after a concert in Atlanta. "It was just mind-blowing listening to this raw, simplistic performance," Carter recalled. "It just felt like the right next move to let the world hear this version of it." He calls it "a jam session" intended for music lovers, not super fans. Except for a few gaps, the tape sounds clean and is presented start to finish as Prince recorded it in his now-demolished home in Chanhassen, Minnesota, the year before his 1984 hit movie and soundtrack "Purple Rain." Prince runs through "17 Days," the B-side to his hit single "When Doves Cry," a quick "Purple Rain" — later to become his signature guitar anthem — Joni Mitchell's "A Case of You," ''International Lover" from his 1982 album "1999" and "Strange Relationship," not officially released until his 1987 album "Sign 'O' the Times." Prince pounds out chords and breaks into improvisational riffs, running up and down the keyboard while singing in a strong, clear voice. A highlight is Prince's passionate singing of "Mary Don't You Weep," an African-American spiritual featured over the closing credits of Spike Lee's new movie "BlacKkKlansman," about a black Colorado policeman who infiltrates the Ku Klux Klan in the 1970s. Carter said he played the song for Lee when the director invited him to an early edit of the movie. "He said, 'I think this is perfect for the movie,'" Carter recalled Lee saying. The song, also covered by Aretha Franklin and the Swan Silvertones, follows the conclusion of the movie, which brings events up to date with footage of the torch-bearing white nationalist rally in Charlottesville, Virginia, and a car ramming counter-protesters and killing a woman last summer. Prince also sounds playful on "Cold Coffee & Cocaine," lowering his voice into a Miles Davis growl. A real treat is the album's closer, "Why the Butterflies," with Prince's delicate piano and yearning, breathy vocals. The tape had been heavily bootlegged for years, but with substandard sound. Michael Howe, Prince's final artists-and-repertoire person at Warner Bros. Records while the musician was alive, was a fan of the tape and wanted to find the master copy. He found it in Prince's vault, home to thousands of unreleased Prince recordings and live performances. "It was in remarkably good condition," Howe said of the consumer-grade cassette. The tape is presented as it was recorded, with Prince stomping his feet, coughing and asking someone to flip the cassette over. "Piano & A Microphone 1983" presents Prince fresh off the success of his double-album "1999" but before his Grammy- and Oscar-winning "Purple Rain," Howe said. Prince "had not yet become the sort of globe-trotting arena-filling superstar that he was destined to become a year later," Howe said. "You can hear him strapping the rocket engine on that would propel him to superstardom." Keyboardist and singer Lisa Coleman, who backed Prince as part of The Revolution, said Prince would spend time exploring songs "until he felt he could really do them justice." "This particular cassette of Prince is such a great little slice of history," said Coleman, who wrote liner notes to "Piano & A Microphone 1983." She calls the tape "invaluable to the scholarship approach" to Prince's music. "You could literally teach a class from this tape if you went into it and deconstructed it," Coleman said. Since Prince's death, his estate has been selective in releasing new material. NPG Records and Warner Bros. Records released an expanded edition of "Purple Rain" last year. Prince's recording of his song "Nothing Compares 2 U" — a hit for Sinead O'Connor in 1990 — was released this year, and Legacy Recordings, a division of Sony Music Entertainment, released 23 Prince catalog titles and the 37-track "Prince Anthology: 1995-2010" to streaming services and digital service providers last month. Carter and Howe are mum on future releases from Prince's vault. "He has a ton of unreleased materials," Carter said. "We're being thoughtful on how much we release to the world when we release it."